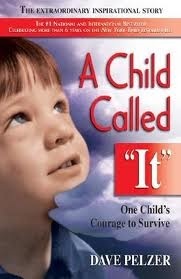 A Child Called "It" is the unforgettable account of one of the most sever child abuse cases in California history. It is the story of Dave Pelzer, who was brutally beaten and starved by his emotionally unstable, alcoholic mother: a mother who played torturous, unpredictable games -- games that left him nearly dead. He had to learn how to play his mother's games in order to survive because she no longer considered him a son, but a slave; and no longer a boy, but an "it." Dave's bed was an old army cot in the basement, and his clothes were torn and raunchy. When his mother allowed him the luxury of food, it was nothing more than spoiled scraps that even the dogs refused to eat. The outside world knew nothing of his living nightmare. He had nothing and no one to turn to, but his dreams kept him alive -- dreams of someone taking care of him, loving him and calling him their son. Through each struggle you'll find yourself enduring his pain, comforting his loneliness and fighting for his will to survive. This compelling story will awaken you to the truth about child abuse -- and the ability we all have to make a difference. Imagine a young boy who has never had a home. His only possessions are the old torn clothes he carries in a paper bag. His only world is isolation and fear. Although this young boy has been rescued from his alcoholic mother, the real hurt is just beginning -- he has no place to call home. This is Dave Pelzer's long-awaited sequel to A Child Called "It." Answers will be exposed and new adventures revealed in this compelling story of his life as an adolescent. Now considered and F-child --a foster child -- young David experiences the instability of moving in and out of five different homes. Those who feel that all foster kids are trouble -- and unworthy of being loved just because they are not part of a real family -- resent his presence and force him to suffer shame. Tear and laughter, devastation and hope: all create the journey of this little lost boy who desperately searches for the love of a family. Though many in society ridicule the foster-care system and social-service fields, Dave Pelzer is a living testament to the necessity of their existence. Whether you are a fan of the author or picking up his work for the first time, The Lost Boy is a sequel that will move you and stand alone as a shining inspiration to all. "All those years you tried your best to break me, and I'm still here. One day you'll see, I'm going to make something of myself." These words were Dave Pelzer's declaration of independence to his mother, and they represented the ultimate act of self-reliance. The more than two million readers of Pelzer's previous international best sellers, know that he lived to tell his courageous story. But even after he was rescued, his life remained haunted by memories of his years as the bruised, cowering "it." Desperately trying to make something of his life, Dave was determined to weather every setback and gain strength from adversity. Dave Pelzer invites readers on his journey to discover how a lost, nameless boy finally found himself in the heart and soul of man who is free at last.